The second most important decision you will make as a parent  apart from deciding to have the kid in the first place  is deciding which school for them to enroll in. Make the right decision and you could put them on a path toward lifelong learning, a prestigious college education and a successful career. Choose wrong, and well, you know. Talk about pressure. Luckily for parents, Peg Tyre, author of The Trouble with Boys and a former Newsweek education reporter, has a new book to help parents evaluate both schools and teachers so they can find the right place for their child. Fittingly, it's called The Good School: How Smart Parents Get Their Kids the Education They Deserve. Tyre spoke to TIME about which questions you should ask when you're evaluating a school  whether your child is starting pre-K or switching schools in the middle of fourth grade  and why math is key in every grade. The connection between child and teacher is more important than any curriculum, Tyre said. Think of it this way: your 3- or 4-year-old is accustomed to being surrounded by loving people, their parents and siblings 24/7, and school is their first time spending a large portion of their day away from those people. You want to look for a preschool teacher who is very engaged, Tyre said. Have a conversation with a prospective teacher about their current classroom. They should be able to speak about individual students' strengths and weaknesses and be well informed of their background, interests, emotional and academic achievements. You want a teacher who takes great pride in his or her students' progress and is consistently open to their improvement. "When I meet great teachers, they are those for whom every day is a new day," Tyre told TIME. "They are constantly ready for their kids to step up and learn more." Above all, Tyre said, avoid crabby preschool teachers and those who are too authoritarian. "I see it all the time  pre-K teachers who are barking orders and being very harsh with kids," she said. "I don't think that's appropriate." Your child should be surrounded with words, especially in the early years, Tyre said. You want to look for books in the classroom and be sure the class makes regular visits to the library. You also want to ensure the teacher sets aside lots of time for reading, reading instruction and storytelling. In the preschool and kindergarten years, be sure the teacher is providing the building blocks for learning to read. They should focus on syllabication, e.g., "B makes the 'bah' sound" and "the boy had a big blue ball." 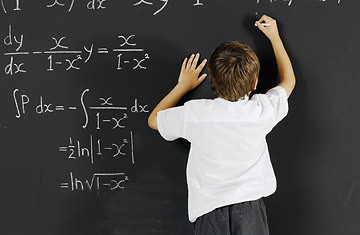 From the first days of school, your kids should be exposed to math concepts. "When your child is preschool age, what you need to know is this: there is no need to wait until children are older and are able to think and speak in more abstract ways to introduce math concepts," Tyre writes in The Good School. "A certain kind of math ability seems to be innate in all of us and has been measured days after birth." Which means, in your child's preschool class you should hear teachers discussing basic math concepts with students. Things like greater than, less than, bigger, smaller and reinforcing the number concept ("How much is three?"). As a parent you can follow up on these things at home by doing something as simple as counting the number of Cheerios in the morning. Don't like math or convinced you are bad at it? Don't tell your kids. Tyre said parents who pass an antimath sentiment on to their kids hurt their chances of success. In the U.S., parents, kids and even teachers may describe a person as "bad at math," but in other countries where kids perform better in math, if a student is not performing well in math, parents, kids and teachers say he or she needs to work harder. "Math is not a talent; like having a good singing voice, it's a muscle you develop," Tyre said. Be on the lookout for a teacher who expresses a great deal of enthusiasm about math, she said. "You do not want a teacher who is scared of math," she said. Sometimes, good test scores can be an indication that a school is doing a very good job of educating its students, but other times it can be an indication that the school is teaching to the test. Standardized tests only measure about a third of the curriculum that should be being taught in the school, which means if the school is only teaching the test material, your child is missing out on a lot. Ideally, a school will teach a rich and complicated curriculum, Tyre said, wherein students get a tremendous amount of information, with the test answers embedded throughout. And, she noted, "Test scores going up for one year means nothing, so drop the contest mentality." Instead, ask to see the desegregated test results that break out various student populations. Focus on the English-language-learning students  even if your child is not one of them  those students are the hardest to teach and are often the lowest quartile, so if their scores are going up, that really says something about the school. But don't stop there, ask why the scores have gone up. You want a thoughtful answer, Tyre said, not simply, Oh, we have this new program that helps us teach the test. What a mistake that is, Tyre said. "No one thinks this is a good idea," she said. Apart from the obvious physical benefits of aerobic exercise, studies have shown recess also increases cognitive functioning, she said. Tyre has seen elementary schools built without playgrounds, schools functioning like boot camps or reading-and-math factories, based on the idea that more instructional time means more learning. "Avoid those schools," Tyre said. "Kids need downtime  a break from the rigor. Twenty minutes a day, at least." The same is true for middle-school and high school students  they need breaks too. While not even a superteacher can entirely alleviate the effects of poverty on students, excellent teachers not only teach more, but they can even accelerate the rate of learning among their students. And good schools champion great teachers, Tyre said. They grow them. Look for schools that provide teachers with mentors, instruction and discussion of best practices. Find a school where the teachers are not being treated as interchangeable cogs. "If you show up and the fourth-grade teacher is now teaching kindergarten, that's not a good sign," Tyre told TIME. "Ask, How has that teacher been prepared for this year? What kind of additional training did they receive over the summer?" Additionally, Tyre recommends that during school tours, parents ask questions such as, "How do administrators evaluate the teachers?" and "How often are classroom lessons observed?" Don't be afraid to ask teachers where they completed their undergraduate studies and what they studied. "It's not snobbery," Tyre said. "Teachers who graduate from more selective colleges  public and private  get better results out of kids." There is no colloquial designation that guarantees quality. Just the word charter or private does not mean the school is a success. In fact, Tyre said, only 1 in 5 charter schools performs better than the schools they replace. "There is no uniformly great private school, no uniformly great charter school and no uniformly great public school," Tyre said. "There is no easy name that you can gravitate toward that will allow you to suspend judgment." So do your homework. The public school down the road could be just as good as the private school that costs $30,000 a year. Read about gay teens suing a Minnesota school district over its bullying policy. Read about how the ACT shows 1 in 4 high school grads is unprepared for college.